Child's Play is a 1988 American horror film directed and co-written by Tom Holland, and produced by David Kirschner from a story by Don Mancini. It is the first film in the Child's Play series and the first installment to feature the character Chucky. It stars Catherine Hicks, Dinah Manoff, Chris Sarandon, Alex Vincent, and Brad Dourif. Hicks plays a widowed mother who gives her son a doll for his birthday, unaware that the doll is possessed by the soul of an infamous serial killer. The film was released on November 9, 1988, and grossed more than $44 million against a production budget of $9 million. Along with the film gaining a cult following, the box office success spawned a media franchise that includes a series of six sequels, merchandise, comic books and a remake film of the same name to be released in the summer of 2019. 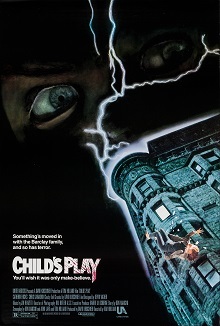 Child's Play was the only film in the series to be distributed by Metro-Goldwyn-Mayer, as the rights to the series were sold to Universal Pictures in 1990, right before production on Child's Play 2 started, but MGM took over distribution again in the 2019 remake of the same name. On the night of November 9, 1988, Charles Lee Ray, a fugitive and serial killer, is chased by homicide detective Mike Norris through the streets of South Side, Chicago after a failed robbery attempt. Mike shoots Charles several times, but he still manages to make it to his getaway vehicle. However, Charles is left behind after his accomplice, Eddie Caputo, panics and drives away without him. Charles breaks into a toy shop, where he is fatally shot by Mike. Realizing that he is dying, Charles transfers his soul into a Good Guys doll, using a Haitian Vodou spell. The store is then struck by lightning, causing it to explode. Mike survives the explosion and enters the shop, only to find Charles' dead body. The following day, widow Karen Barclay unknowingly purchases the doll (now known as Chucky) from a peddler, as a birthday gift for her six-year-old son Andy Barclay. Later that evening, Karen's best friend Maggie Peterson babysits Andy while Karen is working late. After tucking Andy and Chucky into bed, Maggie is hit in the face with a hammer by an unseen assailant and falls out the window to her death. The police search the apartment and Detective Norris deems Andy a suspect. Before going back to bed, Andy claims Chucky killed Maggie. Karen angrily tells the police to leave. The next morning, Chucky orders Andy to skip school and take the Chicago "L" downtown to get revenge on Eddie Caputo for betraying him the night he died. While Andy is distracted, Chucky sneaks into Eddie's house, turning off the kitchen oven's pilot and turning on the gas. Eddie hears the noises from the kitchen, bursts through the door and shoots the oven, which causes his home to explode, killing him in the process. Andy is once again deemed a suspect and placed in a psychiatric hospital. At dusk, Karen attempts to throw the Good Guys box in the garbage. While reading the box, a pack of batteries drop out revealing Chucky has been functioning without them. Unnerved, Karen picks up Chucky and threatens him to speak. Chucky springs to life and bites Karen in the arm, causing it to bleed, before scampering from the apartment. Karen runs after him, only to find Mike at the station. After mistrusting Karen, Mike drives home as Chucky attacks him. Mike shoots Chucky, forcing him to flee. Chucky visits John Bishop, his former voodoo instructor (bokor). John tells Chucky that the longer he stays in the doll, the more human he will become. After John refuses to help, claiming that Chucky has perverted the Vodou religion, Chucky tortures John with a voodoo doll. After John reveals the solution, which is to transfer his soul into the first human he told he was alive (which would be Andy), Chucky stabs the doll, fatally injuring John. After leaving, Karen and Mike discover the gruesome scene. Before dying, John tells them that although Chucky is a doll, his heart is fully human at this point and vulnerable to fatal injury. At the hospital, Andy tries to escape from Chucky. Dr. Ardmore finds Andy in the surgery room and attempts to subdue him before Chucky kills him with an electroshock machine. Andy runs home, followed by Chucky, who knocks him unconscious. Chucky prepares to possess him until Karen and Mike arrive to stop the process. Chucky emerges and assaults Mike with a baseball bat before Karen intervenes and tosses into the fireplace. Andy drops a lit match in it, burning Chucky alive. Karen and Andy leave the room to help Mike, but a charred Chucky escapes the fireplace and chases Andy. Karen dismembers Chucky with a gun and Chucky is again presumed to be killed when he stops moving. Mike's partner Jack Santos arrives at the apartment and calls an ambulance on Mike's injuries. However, Jack refuses to believe the trio's story until Chucky's body bursts to strangle him with his remaining arm. During the struggle, Chucky is shot in the heart and is finally dead. As the ambulance arrives, Mike is taken outside by Karen and Jack, while Andy takes a moment to stare at Chucky's battered corpse before shutting the lights and closing the door in a freeze frame. Alex Vincent as Andy Barclay, a 6-year-old boy who is framed for Chucky's crimes. Catherine Hicks as Karen Barclay, Andy's mother. Chris Sarandon as Detective Mike Norris, a senior homicide police detective and Chucky's arch enemy. Brad Dourif as Charles Lee Ray/Chucky, a well known voodoo serial killer who transfers his soul into a "Good Guys" doll in order to cheat death after being killed by Mike Norris. Dinah Manoff as Maggie Peterson, Karen's friend and Andy's babysitter. Tommy Swerdlow as Jack Santos, Norris's partner. Jack Colvin as Dr. Ardmore, the head doctor of a mental hospital. Raymond Oliver as John "Dr. Death" Bishop, Chucky's former voodoo mentor. Neil Giuntoli as Eddie Caputo, Chucky's old accomplice. Alan Wilder as Mr. Walter Criswell, Karen and Maggie's boss. According to an interview with Mental Floss, screenwriter Don Mancini first conceived of the concept while studying as a film major at the University of California, Los Angeles. He claimed to have been inspired by consumerism, the Cabbage Patch Kids, Trilogy of Terror, and The Twilight Zone episode "Living Doll." The film's executive producer David Kirschner, who would produce all seven films in the Chucky series, claimed in the same interview that he had wanted to make a film about a killer doll after reading The Dollhouse Murders. The director Tom Holland has also affirmed that the My Buddy dolls played a role in Chucky's design. In Mancini's original script Blood Buddy the doll would have been filled with fake blood that would allow it to bleed if played with roughly, and would have come alive after Andy mixed his own blood with the doll's. The doll would have represented Andy's suppressed rage, and would have targeted his enemies. Mancini's original script would have been whodunit story which dealt with the effect of advertising and television on children. Mancini's original script was also written to toy with the audience a bit longer, making it ambiguous whether Andy or Chucky was the killer. Charles Band expressed interest in filming the script, and later produced the Puppet Master franchise. When the script was finally accepted by United Artists, it was rewritten by John Lafia to make the character of Andy more sympathetic. In Lafia's original treatment Charles Lee Ray's soul would have been transferred to the doll after being executed by electric chair as it was being manufactured on an assembly line. William Friedkin, Irvin Kershner, Robert Wise, and Joseph Ruben were approached to direct before Holland was hired on Steven Spielberg's recommendation. Child's Play was filmed in Chicago, Illinois for on-location scenes. The Chicago landmark the Brewster Apartments, located at Diversey and Pine Grove, served as the location of the apartment where Andy and Karen lived and is pictured on the film's poster. In-studio filming took place at Culver Studios in Culver City, California. Maggie's death was originally going to be by electrocution while taking a bath. The idea was abandoned, and was later used for Tiffany's death in Bride of Chucky. The film used various ways to portray Chucky, including RC animatronics and little people or child actors. Various animatronics and cosmetics were used for every scene. Throughout the movie, Chucky's goes through a cosmetic transition from looking toy-like to a more human look. The film created multiple Chucky animatronics such as a flailing tantrum Chucky, a walking Chucky, and a stationary Chucky. The animatronic's face was controlled via remote control through a rig that goes on one's face and captures facial movement. The film initially received negative reviews after a two-hour rough cut was shown to audiences at a test screening. Holland, Kirschner, and Mancini subsequently cut the film to reduce the amount of time Chucky was on screen, something Kirschner had advocated for during production to build suspense in a similar fashion to Jaws or Alien. The three have also suggested that the test screening flopped due to their use of Jessica Walter as the doll's voice. The cut footage, shown only in production stills and the film's script, would have featured Charles Lee Ray stalking a drunk woman as a human only to discover it to be Mike Norris on an undercover sting operation, Andy showing Chucky around his room and finding a photograph of his deceased father, John healing an infant through a Voodoo ritual, and Chucky unsuccessfully trying to break into Andy's room at the mental hospital and tricking a mentally-ill girl named Mona into carrying him into the ward. The script also featured an alternate ending in which Chucky is stabbed by Andy with a knife mounted on an radio-controlled car and has his face and legs melted with a squirt gun filled with Drano in addition to being lit on fire and shot repeatedly by Mike and Karen. Chucky would have been seemingly killed by being overpowered by Jack and several police officers. While storing Chucky's remains in an evidence room, another cop would have disbelieved Jack's assertion that the doll was alive, and after they left Chucky's disembodied arm would have come to life to swat a fly. Child's Play was produced on a budget of $9,000,000. The film was released on November 9, 1988, in 1,377 theaters, opening at #1, out of the other 12 films that were showing that week, with $6,583,963. The film went on to gross $33,244,684 at the US box office and an additional $10,952,000 overseas for a worldwide total of $44,196,684. Child's Play was originally released on VHS in North America by MGM/UA Home Video on April 25, 1989. The film was first released on DVD by MGM in 1999. The film was presented in an open-matte full screen presentation and included a theatrical trailer and a "Making Of" booklet. The Australian DVD release by MGM featured the film in non-anamorphic widescreen transfer. The DVD was re-released in 2007 with a lenticular cover. A 20th Anniversary DVD was released by MGM and 20th Century Fox Home Entertainment on September 9, 2008. The film is presented in its original 1.85:1 Widescreen format (for the first time in the U.S. in 20 years) enhanced for 16x9 monitors and includes an English 5.1 surround track and English, French, and Spanish 2.0 stereo tracks. Special features include two audio commentaries with Alex Vincent, Catherine Hicks, Kevin Yagher, producer David Kirschner and screenwriter Don Mancini, a "Selected Scene Chucky Commentary", "Evil Comes in Small Packages" featurettes, a vintage featurette from 1988 titled "Introducing Chucky: The Making of Child's Play", and "Chucky: Building a Nightmare" featurette, theatrical trailer and a photo gallery. The film received a Blu-ray Disc release on September 15, 2009. The DVD does not feature any contributions from director Tom Holland, who claims he was not asked to contribute to it. In response, the website Icons of Fright contacted Holland and asked if he would be willing to record a commentary track that would be free for download on their website. He agreed, and the track is downloadable from here. On October 8, 2013, the film was re-released again on DVD and Blu-ray in a boxset for the respective formats, containing all 6 Child's Play films. On October 18, 2016, Scream Factory and MGM re-released the film in a brand new Collector's Edition Blu-ray. On October 3, 2017, the film was re-released once again on DVD and Blu-ray in a boxset for the respective formats, containing all 7 Child's Play films. Roger Ebert gave the film 3 out of 4 stars, calling it a "cheerfully energetic horror film." Caryn James of The New York Times praised it as "a clever, playful thriller," adding, "It's the deft wit and swift editing that keeps us off guard, no matter how predictable the plot." Variety called the film a "near-miss", commending Tom Holland's "impressive technical skill" and the actors for keeping "straight faces during these outlandish proceedings," but finding that "the novelty is not buttressed by an interesting story to go along with the gimmick." Kevin Thomas of the Los Angeles Times wrote, "Scary, yet darkly funny, this thriller of the supernatural from the director of the terrific 'Fright Night' moves with the speed of a bullet train and with style to burn." Dave Kehr of the Chicago Tribune gave the film 1 out of 4 stars and wrote that it "would probably be sickening if it weren't so relentlessly stupid." Richard Harrington of The Washington Post wrote that Holland "keeps things moving without rushing them. Unfortunately, 'Child's Play' gets a little ugly at the end, not only because the finale seems a rehash of virtually every shock movie of the last 10 years, but because it involves the very realistic terrorizing of a 6-year-old." Philip Strick of The Monthly Film Bulletin found the plot contrived with "ludicrous supernatural gobbledygook" but thought that Holland handled the action sequences well. Author and film critic Leonard Maltin gave the film three out of a possible four stars, calling it "[a] scary and clever horror thriller", also praising the film's special effects. Review aggregator Rotten Tomatoes reports that 67% of 36 surveyed critics gave the film a positive review; the average rating is 6.4/10. On Metacritic, which assigns a normalized rating to reviews, the film has a weighted average score of 58 out of 100, based on 12 critics, indicating "mixed or average reviews". Audiences polled by CinemaScore gave the film an average grade of "B" on an A+ to F scale. During the initial release, a large crowd of protesters formed at the main entrance of MGM calling for a ban on the film because, they claimed, it would incite violence in children. Local news reporters from two TV stations were broadcasting live from the scene. The producer, David Kirschner, was watching the demonstration on TV and was disturbed. Jeffrey Hilton, who had been working in Kirschner's office at MGM, indicated that he could quell the disturbance in 10 minutes. While Kirschner was watching from the safety of his office, Hilton spoke to the group's leader and shook his hand. The group instantly dispersed, much to the chagrin of the newscasters. Hilton did not reveal to Kirschner whether it had been a threat or simple diplomacy that saved the day. Hilton's diplomacy notwithstanding, the film series was plagued with accusations of inciting violence in children. Child's Play 3 was cited as the "inspiration" for two murders, which took place in the United Kingdom in December 1992 and February 1993 respectively: the murder of Suzanne Capper and murder of James Bulger. In the Suzanne Capper case, the 16-year-old was forced to listen to recordings of the gangleader repeating the catchphrase "I'm Chucky, wanna play?" Tom Holland, in response to both murders, defended the film, stating that viewers of horror movies could only be influenced by their content if they were "unbalanced to begin with." The film was followed by several sequels including Child's Play 2 (1990), Child's Play 3 (1991), Bride of Chucky (1998), Seed of Chucky (2004), Curse of Chucky (2013) and Cult of Chucky (2017), followed by a television series titled Child’s Play: The TV Series. A reboot of the franchise was announced by Metro-Goldwyn-Mayer to be in development beginning in July 2018. Lars Klevberg will serve as director, from a script by Tyler Burton Smith. The film will be co-produced by Seth Grahame-Smith, David Katzenberg and Aaron Schmidt. The adaptation will reportedly feature a group of kids who come into contact with a modern-day hi-tech version of the Good Guys doll. Gabriel Bateman and Aubrey Plaza were cast as Andy Barclay and his mother Karen, respectively. The film is scheduled to be released on June 21, 2019. "Dolls", a 1987 Italian-American horror movie about killer dolls. ^ "Child's Play (1988)". AFI Catalog of Feature Films. Retrieved January 27, 2018. ^ "Child's Play (1988)". The-Numbers. ^ "Child's Play". Box Office Mojo. ^ "Chucky set to return in new sequel to Child's Play movies". Metro. Retrieved December 6, 2016. ^ a b c d "Your Friend 'Til the End: An Oral History of Child's Play". mentalfloss.com. 2016-10-28. Retrieved 2019-02-18. ^ Media, Comcast Interactive (21 June 2013). "Director Tom Holland Reveals 'Child's Play' & 'Fright Night' Secrets - Movies". ^ a b c "How 'Child's Play' Survived Bad Test Screenings to Become a Horror Classic". The Hollywood Reporter. Retrieved 2019-02-18. ^ Hamblin, Cory (2009). Serket's Movies: Commentary and Trivia on 444 Movies. Dorrance Publishing. ISBN 9781434996053. ^ a b Case, Lindsay (25 October 2014). "Six Things You Didn't Know About the Child's Play Franchise". AMC. Retrieved 20 February 2015. ^ "Full text of "Child's Play (1988) Script"". archive.org. Retrieved 2019-02-18. ^ "November 11-13, 1988". boxofficemojo.com. Retrieved 2012-08-28. ^ "Child's Play". boxofficemojo.com. Retrieved 2011-04-19. ^ "Child's Play [Collector's Edition] - Blu-ray - Shout! Factory". www.shoutfactory.com. ^ James, Caryn (November 9, 1988). "A Killer Companion in 'Child's Play'". The New York Times: C19. ^ "Child's Play". Variety: 18. November 9, 1988. ^ Thomas, Kevin (November 9, 1988). "'Child's Play' Packed With Chills and Thrills". Los Angeles Times. Section VI, p. 3. ^ Kehr, Dave (November 10, 1988). "There's enough trauma in 'Child's Play' to give any kid nightmares." Chicago Tribune. Section 5, p. 12. ^ Harrington, Richard (November 10, 1988). "'Child's Play': The Doll Did It". The Washington Post: B17. ^ Strick, Philip (June 1989). "Child's Play". The Monthly Film Bulletin. 56 (665): 174. ^ Maltin, Leonard; Carson, Darwyn; Sader, Luke. Leonard Maltin's 2014 Movie Guide. Penguin Press. p. 244. ISBN 978-0-451-41810-4. ^ "Child's Play". Rotten Tomatoes. Flixster. Retrieved June 16, 2018. ^ "Child's Play Reviews - Metacritic". Metacritic.com. Metacritic. Retrieved 17 June 2018. This page was last edited on 24 April 2019, at 12:55 (UTC).